Note: The installation path of 20-sim 4C (e.g. C:\Program Files\20-sim 4C 2.1) will be referred to as "the 20-sim 4C installation dir" below. Note: Sometimes, the installation script raises an error, in that case, Scilab needs to be restarted one more time. 1.Open a scilab model for code generation. A sample model found at '<20-sim 4C installation dir>\examples\scilab\demo.xcos' can be used for testing. 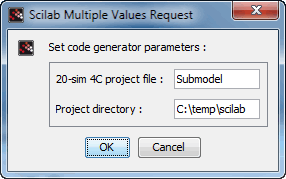 2.Select the desired sub-model from the scilab model. 3.Start the code generation from the menu bar > tools > 20-sim 4C code generation. This will open a dialog on where to save the sub-model. This starts the code generation process and 20-sim 4C will be opened. 4.Select your target (Note: Scilab code generation currently works with RTAI targets only) and Run the code. So far, the event-time triggering the square source is not exported from the Xcos model to 20-sim 4C. Therefore, add the proper event duration to the square block named gensqr. •The correct event time of external activated blocks within Xcos should be entered manually into 20-sim 4C. •Block names from within Xcos are not transferred to 20-sim 4C. •The first model calculation is executed at model initialization. This causes, for example, a square wave to start with the opposite sign. •The superblock used for code generation cannot itself contain superblocks. oTIME_DELAY. Note that the discrete time delay z-1 can be used. oDELAYV_f. This block is not supported because it generates events. oQUANT_f. The quantizer is not supported yet. oAUTOMAT. This block is not supported because it generates events. oDELAY_f. Note that a delay can be realized by using the z-1 block. oDLRADAPT_f. This block is not supported yet. oThis palette is not supported yet. ono blocks are supported. Note that every clock-triggered block has its own clock within 20-sim 4C. (as long as the desired activation time is >= stepsize of the complete model. oMATMAGPHI. This block is not supported yet. oMATZREIM. This block is not supported yet. oMAXMIN. This block is not supported yet. oMAX_f. This block is not supported yet. oMIN_f. This block is not supported yet. oMatrices are not supported yet. oNot supported. Note that the functions within this palette are in particular useful for the interface between an analog and a digital system. oSigbuilder. This block is not supported because it generates events.